As the bloody stain from Al Shabaab’s attack in Nairobi spreads, we grieve not only for those who died or were injured, and their families and friends, but also for the many innocents affected by its preparation and financing. Tragically, that long list includes thousands of slaughtered elephants, because it is their ivory that, in part, helped finance the Westgate assault. Income from ivory smuggling helped pay the soldiers, buy the weapons, rent the shop used for scoping and staging, and likely even purchase the computer that tweeted updates as events unfolded. The link between this attack and wildlife smuggling is clear. Andrea Crosta and Nir Kalron’s 18-month undercover investigation showed that the illicit trade in ivory and rhino horn supplies Al Shabaab with important financial resources. Moreover, when Somalia’s Kismayo port was retaken from insurgents by the Kenya Defense Forces this summer, the illegal wildlife trade became a financial savior for Al Shabaab. The investigation detailed how Al Shabaab acts as a middleman, filling orders from agents in end-user countries in Asia or the Gulf states. It confirmed that the terrorist group pays better than average prices (U.S. $200 per kilogram in 2011-2012), making them desirable buyers of illicit ivory from small-time brokers. It is then these small-time brokers, often related to the terrorists by clan, who engage the poachers, paying $50 per kilogram (although the price varies considerably) for what they know will make a hefty return. Al Shabaab’s spot as a premier broker is attributable to its financial and organizational prowess but also to the lack of ready alternatives. Recently, the Kenya Wildlife Service (KWS) has cracked down on ivory smuggling at its ports and airports, making Al Shabaab an even more attractive market, with a reputation for good prices, immediate payment, and ready access (prior to the Kenya invasion) to outlets at the ports of Marca and Kismayo as well as the airport in Mogadishu to conduct its smuggling. Yet the real boon for Al Shabaab’s ivory business is soaring demand in consuming countries, which translates into high prices. Illicit raw ivory now fetches over $1,500 per kilogram in Asia; in China the “official” cost for raw ivory is supposedly more than $2,865 per kilogram. That means higher profits for Al Shabaab—and a treasury it can use to wreak chaos. That cache of money allows Al Shabaab to pay their fighters well and regularly. Shabaab mercenaries get about $300 a month, while soldiers in Somalia’s regular army earn far less. It is these profits that help them recruit and sustain their fighters. Ivory is their financial lifeline. Consumers can help break that lifeline by not buying ivory. Every illegal ivory carving purchased has an associated trail of blood that puts money in the pockets of terrorists who spend it on fighters and bullets and bombs to kill innocent people, most recently those in the Nairobi shopping mall. While we welcome recent actions, such as President Obama’s Executive Order and the just announced three-year 80-million-dollar Clinton Global Initiative (CGI) Commitment to Action, which brings together NGOs, governments, and concerned citizens to stop wildlife trafficking and the slaughter of Africa’s elephants, it is ivory consumers who have the real power. It is consumers who must understand the human toll of their purchases—and act accordingly. They must understand that their purchases exact a toll that is not limited to the victims of specific attacks funded by poaching. Or the rangers who lose their lives protecting elephants and rhinos. The toll is wider and even more destructive. It includes farmers killed or injured by irate elephants reacting to their poaching-related traumas. It includes widows and orphans who lose husbands, fathers, and family breadwinners from death, injury, or incarceration. It includes villagers and disadvantaged communities who are exploited or forced into criminal activities. It is the consequent insecurity and lawlessness and corruption that shuts down tourism and weakens economies. It cost roughly $200,000—the equivalent of 24 elephant tusks or one rhino horn—for Al Shabaab to plan, prepare, and execute the Westgate mall attack. 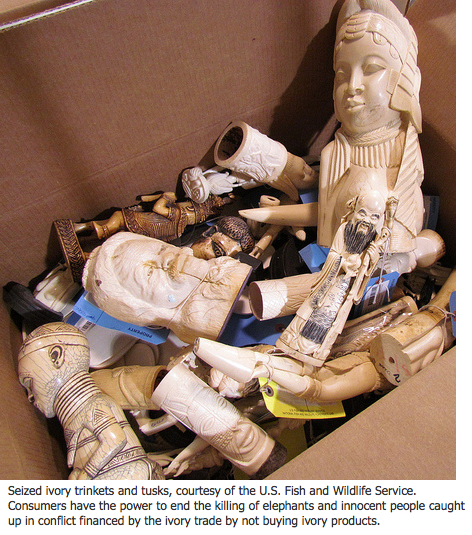 Consumers can kill the ivory market. They can end the deadly path of conflict ivory. It’s time for ivory consumers, traders, and everybody in between to take responsibility not just for the death of thousands of elephants but also for its very high human toll.